What does the term "double up" mean in poker? 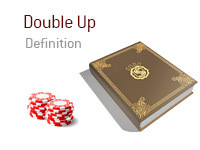 What is the definition of the term "double up" in poker? In poker, a "double up" occurs when a player doubles their stack over the course of a single hand. For instance - let's say that you are playing in a $50 tournament at your local casino. You are down to just 4,400 chips, which is considerably below the average stack. The blinds are currently 250/500. Action folds around to you on the button, and you look down at Ah-3h. The blinds just took a big chunk out of your stack, and you want to build up your chips a bit before the blinds hit you again. You decide that this is a perfect hand to shove on in the hopes of winning the blinds. You shove. The SB calls, while the BB folds. The SB has you "covered", meaning he has more chips than you do. The SB turns over Ks-Qs, while you flip over your Ah-3h. The board runs out As-3s-Kh-8d-7d, giving you two pair and the pot. Thanks to the blinds, you more than "doubled up" in the hand, as you now have over 9,000 in chips.